The FMC humidity detector can accurately measure absolute humidity in diverse building materials. To detect humidity, the FMC humidity detector has a connection for external sensors which can either be inserted into the building material or placed on it. This detector corrects the measured humidity value in real percentages in relation to the selected material and the temperature (according to dry/absolute humidity). The humidity detector can be used both in input controls and to measure on site: concrete, asbestos, cement, plaster, lime-stone, pavement, bricks, etc. The FMC humidity detector has some characteristic curves stored to measure different materials. These curves can be displayed by accessing them through the keyboard. It is important to choose a humidity probe that best suits the material which is going to be measured. There are different models for different applications and materials. The FMC humidity detector can be used for all kinds of measurements. Below you will find characteristic curves in alphabetical order of all the most important wood types (they are stored in the humidity detector). We can also send another list with more wood types. In both cases, you should measure near the area that is going to be measured and use the mean value. Due to the inhomogeneous composition of wood, oscillations in gross density can appear while measuring the same wood type. So you will have to take diverse humidity measurements. The overall result will be the mean value calculated by the detector. Here you will find a wide range of probes which can be adapted to different measuring instruments. You will be able to choose the probe that best suits your needs. It is hooked up with both plugs to the universal probe holder/humidity is measured in the black measuring surface. This contact sensor works without causing any damages to the material. It is specially indicated to measure humidity on printed wall-papers, plastics, valuable woods and other building materials where it is important to measure without causing any damage. It is hooked up with both pins to the universal probe holder. Humidity is measured with 4 x 1.5 mm length pins on a rounded metal surface divided into two parts. It measures moisture content of cork, rubber, soft building materials and roof insulators. 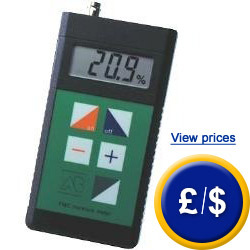 To accurately measure humidity in diverse concrete depth. It is hooked up with both plugs to the universal probe holder. Humidity is measured by the two ends of the pins. It is very suitable for great diameter woods, beams, timber planks as well as for diverse insulation materials and fiber or for light building foam materials as foams.